Duluth, MN: On April 22, 2016, GPM Distribution, Inc., attended Flowserve Corporation’s (NYSE:FLS) annual North American Distributor Meeting held in Miami, Florida. 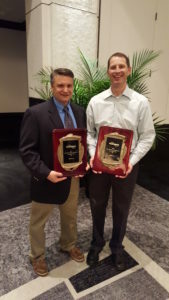 The Company received two awards recognizing them as one of the top distributors in Flowserve’s North American distribution network. GPM has progressively moved up in rank for total bookings in successive years with a 10th place in 2013 and a 9th place in 2014. “GPM has always done a very good job in supporting our customer’s aftermarket needs, but 2015 was exceptional for us, stated Bob Gemuenden, VP and General Manager of GPM, Distribution Inc., “I am extremely proud of the entire GPM team and their hard work and feel strongly we will build on this growth in 2016,” Gemuenden remarked. Flowserve is the recognized world leader in supplying pumps, valves, seals, automation, and services to the power, oil, gas, chemical, and other industries. With more than 16,000 employees in more than 50 countries, they combine global reach with a local presence. To learn more, visit: www.flowserve.com or contact sales@gpmco.com.